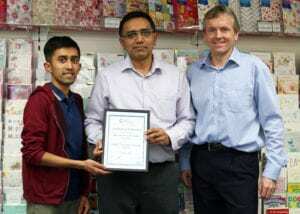 When father and son team Karsan Naran & Avneesh Sangani invested in the Card Connection area of Macclesfield earlier this year, it was hardly a step in the dark. That’s because Avneesh is the brother of Dilip Sanghani, who has been successfully running the Manchester franchise of Card Connection since 2014.
been impressed with the product and professionalism of the card Connection model. So when the opportunity came up to purchase the neighboring territory of Macclesfield, he decided it was the perfect opportunity to invest in thi s business with Avneesh, his son. Card Connection is part of UK Greetings, which is a subsidiary of American Greetings Inc., one of the largest greeting card publishers in the world and has limited vacancies for franchisees that are keen to run an expanding business. Since the franchise network in the UK is complete, the available opportunities now consist of acquiring an already-established territory from an existing franchisee. These vary in price according to their level of development, but start at £35k + Stock + Card Connection fee with earnings potential in excess of £50k per annum.